A Handy Guide for Families Traveling to Buenos Aires! 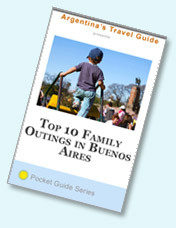 This free pocket guide includes 10 great outings for you and your family, while on vacation in Argentina. Packed with helpful information, photos and insider tips! To get it now, simply put your first name and email in the box and click Send. There’s no denying it; vacations are different once kids hit the scene. But that doesn’t mean they can’t be fun! — Amanda Fernandez, author of Top 10 Family Outings in Buenos Aires. We agree! Argentina’s Travel Guide is dedicated to helping you have the best travel experience in Argentina. So we are proud to offer the first guide to Buenos Aires which focuses on child-friendly attractions. Each destination has been vetted by a real moms and their kids! This page rendered in 0.454 seconds.